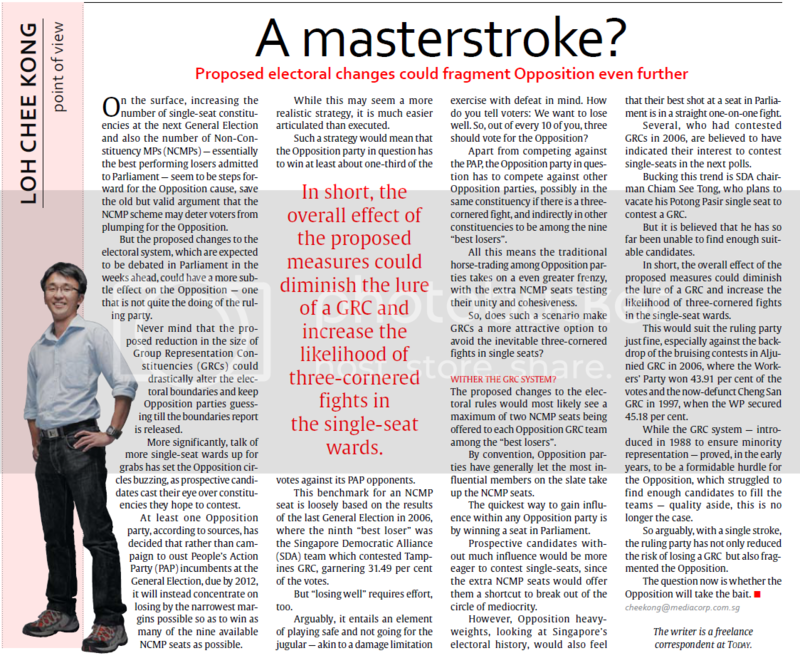 In his article entitled, “A masterstroke?” (Jan 9), TODAY correspondent Loh Chee Keong argued that the recent proposal of allowing more NCMP seats might fragment the opposition and diminish the lure of trying to capture a GRC. 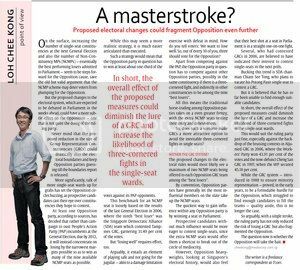 Loh argues that the extra NCMP seats would test the opposition’s unity and cohesiveness as candidates from rival parties would now have an incentive to compete against each other tobe one of the nine “best losers” rather than focusing on fighting against the PAP. Some opposition candidates might also be more eager to contest in single seat wards as opposed to GRCs in the hopes of increasing their chances of entering Parliament. These arguments unfortunately caricature opposition candidates as selfish individuals who are more concerned about their own prestige rather than with working for their respective parties and for the opposition as a whole. In his opening paragraph, Loh accepts the view that the proposed electoral changes seem to be steps forward for the opposition cause, save that the NCMP scheme may deter voters from voting for the opposition (as there would be nine guaranteed seats for the opposition). But what the mainstream media has consistently ignored is the fact that elections in Singapore are neither free nor fair. The ruling party has itself admitted that the GRC system serves its own interest by making it easier for fresh recruits to enter Parliament. High election deposits make it a challenge for opposition candidates to contest. Furthermore, elections are overseen not by an independent council but placed under the purview of the Prime Minister’s Office. There is a complete absence of independent oversight to ensure accountability and transparency both in the drawing of constituency boundaries as well as the elections process. The recently proposed amendments to our electoral system to allow more NMPs and NCMPs are merely cosmetic changes that do not address the above-mentioned issues which have been repeatedly brought up by opposition parties. In my view, these changes are hardly a political masterstroke but merely an acknowledgment by the ruling party that the ground has shifted in favour of the opposition. It is therefore an attempt by the ruling party at limiting the damage it may suffer in the next election. Reducing the size of the GRCs would mean the PAP would lose less MPs should the opposition manage to capture a GRC or two. Granting the opposition more space in Parliament might serve to assure voters that there would be a plurality of voices in Parliament and encourage them to continue voting for the PAP. In reality however, NCMPs have less voting rights than regular MPs, and such a token concession to the opposition does not in any way strengthen democracy in Singapore or address the flaws in our electoral system. Singaporeans would be far better served by a fair and transparent election system that allows opposition MPs a fair chance of entering Parliament on their own merit by winning the hearts and minds of the people, rather than on the patronage of the PAP. If opposition candidates succumb to the temptation of competing with each other rather than against the PAP to be one of the nine “best losers” and miss the forest for the trees, than these electoral changes could turn out to be a clever way of fragmenting an already fragile opposition. But in my opinion, these electoral changes are just an attempt by the ruling party at accommodating society’s need for more dissenting voices while maintaining a firm grip on power. These token concessions ultimately bear the semblance, but hardly the substance, of liberalization.